Immaculately preserved, central Avignon is enclosed by medieval walls, built in 1403 by Pope Benedict XIII, the last of nine popes who based themselves here throughout the 14th century. 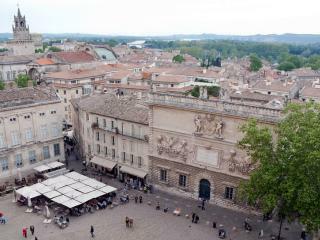 As home to one of the richest courts in Europe, 14th century Avignon attracted hordes of princes, dignitaries, poets and raiders, who arrived to beg from, rob, extort money from and entertain the popes. The medieval city is dominated by the massive Palais des Papes (Popes' Palace). This red-bricked beauty was Christianity's power base in the 14th century. With its massive stone vaults, battlements and sluices, the palace was built primarily as a fortress, though the two pointed towers, which hover above its gate, are extremely graceful. The austere walls of the Palace enclose a rich interior, enlivened with Italian frescoes. Highlights include the Stag Room (where hunting scenes adorn the walls), the outsized Grand Tinel, where the Pope dined on a raised platform, and the ornate Pope's Bedchamber. The Pont Saint Bénezet (Avignon Bridge), inspired the unforgettable 19th century jingle, "Sur le Pont d'Avignon, L'on y danse..." Legend has it that a humble shepherd built the bridge after a heavenly vision. From the 11th to 17th centuries the bridge spanned the whole River Rhône and river-island Ile de la Barthelasse. Today only four out of 22 arches still stand, the rest have been washed away by the powerful Rhône. What remains is hugely atmospheric, particularly the tiny crumbling Saint Nicholas Chapel, dedicated to the Patron Saint of Mariners. Next to the Palais des Papes, the 12th century Cathédrale Notre-Dame-des-Doms is a Romanesque structure, whose interior was later was decorated in decorative Baroque style. From the Palais des Papes climb to the hilltop garden of the Rocher des Doms, where the first inhabitants - the Chaseens - settled in 4000 BC. It will remind you of a typical Victorian rock garden, with sculptures of Provenĉal poets, grottoes and lake. 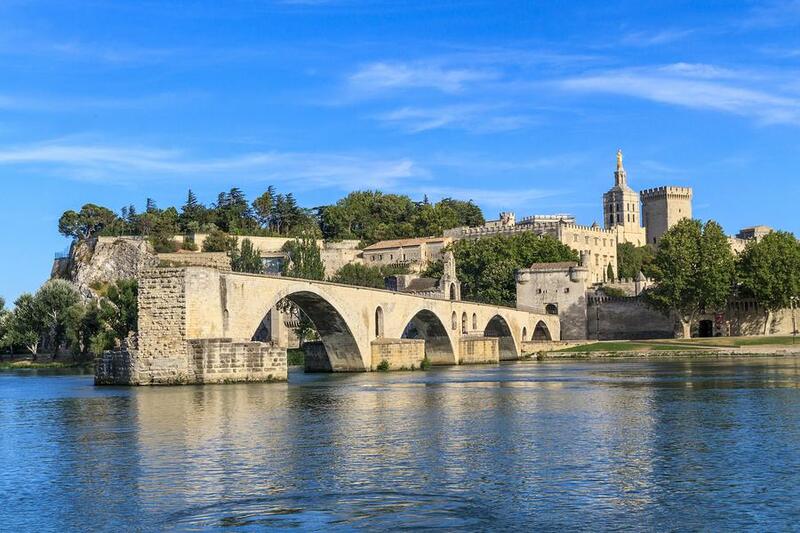 Here, there is a wonderful view of the River Rhône, Avignon's Bridge, Villeneuve-lès-Avignon (over the river) and the gleaming spire of the cathedral. It's particularly beautiful at sunset, when the sun catches the red brick and turns it to gold. Explore the winding streets of the old city, evocatively named after medieval trades. The rue des Teinturiers (once home to calico printers) is one of the most atmospheric streets. Its name refers to the 18th and 19th century business of calico printing. The cloth was washed in the Sorgue canal, which still runs alongside the street, turning the wheels of long-gone mills. The street is dotted with small restaurants and arts and crafts shops. Many of Avignon´s museums are set in grand townhouses. The excellent Musée Calvet is housed in an impressive 18th century palace. The Galerie des Sculptures features a handful of languorous 19th century marble sculptures, including Bosio's Young Indian. The Puech collection displays a large selection of silverware, Italian and Dutch paintings and a Flemish curiosities cabinet, painted with scenes from the story of Daniel. There are works by Nicolas Mignard, Joseph Vernet, Jacques-Louis David, Géricault, Vlaminck, Bonnard and Chaïm Soutine, in addition to a good archaeology collection. 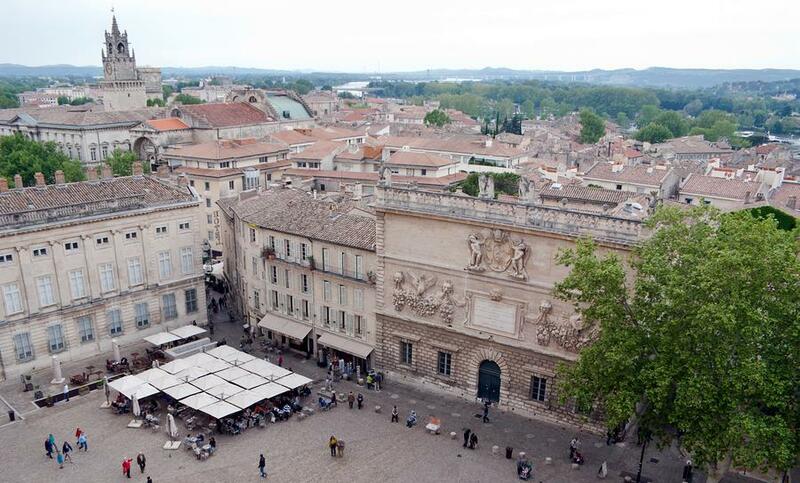 Time permitting, explore Avignon's other museums. You'll find contemporary art in the 18th-century Hôtel de Caumont, quirky decorative art in the Musée Louis Vouland and Impressionist art - from Van Gogh to Picasso - at the Musée Angladon. Temporary exhibitions are also held at the Grenier à Sel (a 16th century salt warehouse by the Palais des Papes) and the curious Musée du Mont de Piété - France's oldest pawnbroker's museum, now home to the town's archives. Avignon can be dauntingly crowded in summer and very hot. The town goes culture mad each summer at July's Festival d'Avignon, when Europe's best theatre (and music, circus and dance) is performed in every nook and cranny of the city - from the Palais des Papes' courtyard, to 18th century mansions, old convent buildings and secret gardens. The festival was founded by Jean Vilar in 1947. 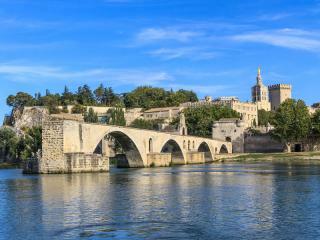 Be sure to book accommodation well in advance if you plan to visit Avignon during July or early August. If time permits, rent a car and explore the nearby countryside of beautiful Provence. The "Pont du Gard" aquaduct is only 18 miles south-west from the city while the Roman City of Vaison la Romaine is 31 miles north-east of Avignon. Both are unforgettable and easy to reach in a day trip.